Wow, this ship is huge! When you walk or drive along Via Giuseppe Garibaldi in Messina, a wide road running parallel to the shore and the port, you could at first sight believe that there is another row of multi-storey buildings behind the ones you’re passing by. Only at second sight do you notice that these massive structures which are twice as high as the buildings in that area are actually cruise ships. Here is another one entering the port and overshadowing all the buildings in the vicinity. If you know that the tower of the Cathedral is around 60 meters high, you get a sense for the measurements of that boat. It’s huge. Not only are these boats huge, but they also house thousands of passengers, which they spew out for day trips at each of their stops around the Mediterranean Sea. That day in Messina, I was lucky enough to meet two of its passengers, a friendly couple from Canada, who told me about their cruise around the Mediterranean and made the idea of a cruise quite palatable, even more so when I heard that it’s less expensive than I had always thought. That, and I just couldn’t forget the sight of the water slide on top of the ship. 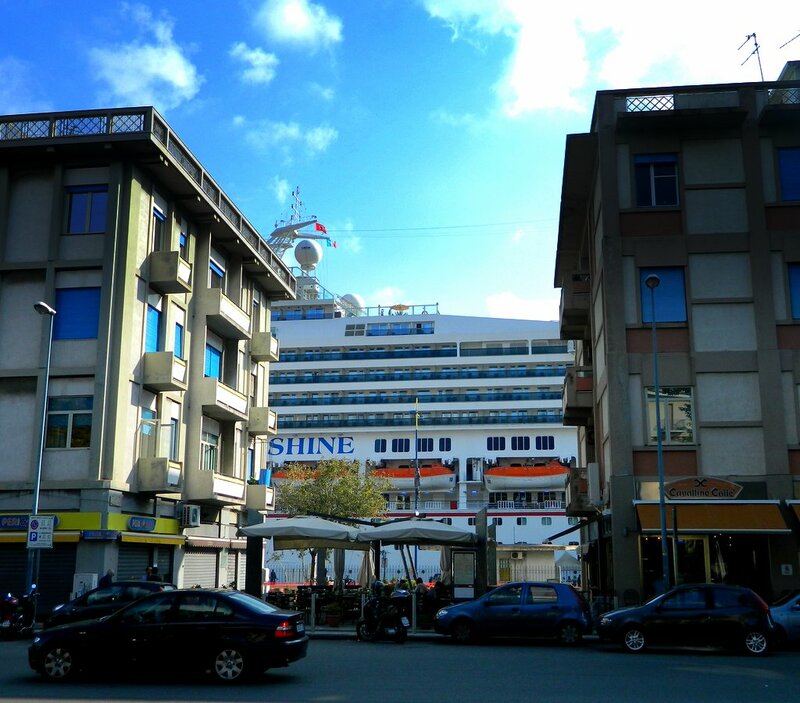 This entry was posted in Italy, Photography, Sicily, Travel and tagged Carnival Sunshine, Messina, ships. Bookmark the permalink. 10 Responses to Wow, this ship is huge! This is what the boats look like when they pull into venice. Massive drifting cities that shadow everything in their path. Not sure what appealing to taking a cruise. I’d rather travel on foot. Walking is much better when you have time, that’s true. I was mainly intrigued by the information that the ship crosses the Atlantic twice a year to be repositioned (between Mediterranean and Caribbean) and that this ride is relatively cheap because not many tourists are on board. Spending two weeks on the Atlantic sounds great. Slow travel of a different kind. In the case of Venice I understand that they want to get rid of these mega-ships. I think a cruise is a great way to get a glimpse of many destinations while not overextending yourself..not really an issue if you are young and healthy, but for example, my mother in law has Fibromialgia which can act up at any given time causing her to be exhausted and in pain, however, stress, fatigue, lots of walking, and cramped airplanes definitely increase her chances of being out of order for a few days. Although I don’t see the appeal of a cramped boat in the middle of the sea, I certainly can see the appeal of the comfort, multiple stops, rest periods between high excitement exploring, and the whole slew of activities! There is a cruise ship, I believe it belongs to Disney, that has a water slide that goes out over the side of the boat before coming back in and down into the pool!! How awesome must that be?? Also..this Atlantic crossing you speak of is VERY interesting!! I also find the Atlantic crossing most enticing because you are on the sea for several days. I wonder what that does to you. I am always looking for circumstances that give me enough time to read and write. Up to 25 days without many disturbances sounds perfect to me. I’ll bring a chest of books and I’ll be the happiest passenger ever. Do you know the essay/book “A Supposedly Fun Thing I Will Never do Again” about taking a cruise, by David Foster Wallace? If you just read it, you will never have to experience it yourself ! I have added the book to my wishlist.